Pioneers in the industry, we offer diltiazem hci tablet, furosemide tablets, ligustrazine injection, adenosine injection, atropine sulphate injection and amlodipine tablets from India. We are leading exporter and manufacturer of Diltiazem HCI Tablet. Diltiazem is used in the treatment of increased blood pressure, angina and arrhythmias. Diltiazem is a calcium channel blocker. It blocks the action of calcium on the heart and blood vessels. This effect reduces blood pressure and abnormally fast heartbeat which lowers strain and oxygen requirement of the heart. Diltiazem HCI Tablet exporter in India. We are leading Exporter and Manufacturer of Furosemide Tablets. 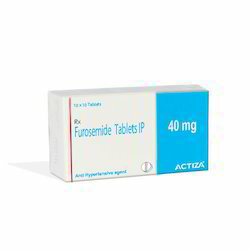 Furosemide Tablets exporter in India. We are leading Exporter and Manufacturer of Ligustrazine Phosphate Lyophilized Injection. 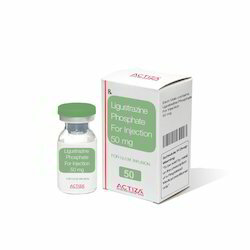 Ligustrazine Phosphate Lyophilized Injection Lyophilized Injection exporter in India. We are leading Exporter and Manufacturer of Adenosine Injection. Adenosine treats irregular heartbeat by blocking abnormal electrical signals in the heart. Adenosine Injection exporter in India. We are leading Exporter and Manufacturer of Atropine Sulphate Injection. Atropine sulphate 6mg injection belongs to class of medication called as anticholinergic drugs. It acts by blocking the activity chemicals (acetylcholine) in the body, thereby producing effects such as reduction of salivary and other body secretions, relief of abdominal pain due to cramps, increase in the heart rate, and widening of the pupil. Atropine Sulphate Injection exporter in India. We are leading Exporter and Manufacturer of Amlodipine Tablets. Amlodipine Tablets exporter in India. We are leading Exporter and Manufacturer of Atenolol Tablets. UsesAtenolol is used in the treatment of angina (chest pain), arrhythmias (abnormal heart beat), heart attack and increased blood pressure How it works Atenolol blocks the action of certain chemical messengers on the heart and blood vessels. This can lower the blood pressure, abnormally fast heartbeat and reduces strain on the heart following a heart attack.Common side effectsNausea, Headache, Fatigue, Dizziness, Slow heart rate, Breathlessness, Diarrhoea, Palpitations, Abdominal pain, Constipation Atenolol Tablets exporter, Atenolol Tablets manufacturer Atenolol Tablets supplier, Atenolol Tablets manufacturer in India, Atenolol Tablets exporter in India. We are leading Exporter and Manufacturer of Candesartan Tablets. Candesartan Tablets exporter in India. We are leading Exporter and Manufacturer of Captopril Tablets. Uses Captopril is used in the treatment of increased blood pressure , heart failure, heart attack and diabetic kidney disease How it works Captopril relax the blood vessels which lower the blood pressure and also reduce the workload of the heart. As a result, the heart works more efficiently.Common side effects Breathlessness, Headache, Fainting, Dizziness, Blurred vision, Increased heart rate, Orthostatic hypotension (sudden lowering of blood pressure on standing), Weakness, Allergic reaction, Nausea, Abdominal pain, Irregular heart rate. Captopril Tablets exporter in India. We are leading Exporter and Manufacturer of Losartan Tablets. Losartan Tablets exporter in India. We are leading Exporter and Manufacturer of Nifedipine Tablets. Nifedipine Tablets exporter in India. We are leading Exporter and Manufacturer of Nitroglycerin Capsules. UsesNitroglycerin is used in the treatment of angina (chest pain) and coronary artery diseaseHow it worksNitroglycerin lower the workload of the heart. As a result, the heart muscles do not need as much blood and oxygen supply.Common side effectsHeadache, Dizziness, Increased heart rate, Flushing of face, Orthostatic hypotension (sudden lowering of blood pressure on standing). Nitroglycerin Tablets exporter in India. We are leading Exporter and Manufacturer of Olmesartan Tablets. Olmesartan Tablets exporter in India. We are leading Exporter and Manufacturer of Propranolol Tablets. Propranolol Tablets exporter in India. We are leading Exporter and Manufacturer of Ramipril Tablets. Ramipril Tablets exporter in India. We are leading Exporter and Manufacturer of Telmisartan Tablets. Telmisartan Tablets exporter in India. We are leading Exporter and Manufacturer of Clopidogrel Tablets. Clopidogrel Tablets exporter in India. We are leading Exporter and Manufacturer of Lisinopril Tablets. How it works: Lisinopril relaxes the blood vessels which lowers the blood pressure and also reduces the workload of the heart. As a result, the heart works more efficiently. Lisinopril Tablets exporter in India. We are leading Exporter and Manufacturer of Bosentan Tablets. Bosentan Tablets exporter in India. We are leading Exporter and Manufacturer of Carvedilol Tablets. Carvedilol Tablets exporter in India. We are leading Exporter and Manufacturer of Rosuvastatin Tablets. Rosuvastatin Tablets exporter in India. We are leading Exporter and Manufacturer of Ezetimibe Tablets. Ezetimibe Tablets exporter in India. We are leading Exporter and Manufacturer of Finofibrate Tablets. Like other fibrates, it reduces both low-density lipoprotein (LDL) and very low density lipoprotein (VLDL) levels, as well as increasing high-density lipoprotein (HDL) levels and reducing triglyceride levels. It is used alone or along with statins in the treatment of hypercholesterolemia and hypertriglyceridemia. However, due to lack of cardiovascular benefit in several large trials and the risk of side effects such as muscle damage, the FDA withdrew approval for the use in high cholesterol treatment in combination with statins. Finofibrate Tablets exporter in India. We are leading Exporter and Manufacturer of Hydrochlorothiazide Tablets. Hydrochlorothiazide Tablets exporter in India. We are leading Exporter and Manufacturer of Simvastatin Tablets. Simvastatin Tablets exporter in India. We are leading Exporter and Manufacturer of Metoprolol Tablets. Metoprolol blocks the action of certain chemical messengers on the heart and blood vessels. This can lower the blood pressure, abnormally fast heartbeat and reduces strain on the heart following a heart attack. Metoprolol Tablets exporter in India. We are leading Exporter and Manufacturer of Trimetazidine Tablets. Trimetazidine Tablets exporter in India. We are leading Exporter and Manufacturer of Atorvastatin Tablets. Uses Atorvastatin is used in the treatment of increased cholesterol levels in blood, increased triglycerides levels in blood and increased LDL levels in bloodHow it works Atorvastatin blocks an enzyme (HMG-CoA-reductase) that is required in the body to make cholesterol. As a result, it lowers the level of cholesterol in the body.Common side effects Musculoskeletal (bone, muscle or joint) pain, Allergic reaction, Headache, Nausea, Dyspepsia, Nasopharyngitis, Increased liver enzymes. We are leading Exporter and Manufacturer of Isosorbide Mononitrate Injection. Isosorbide Dinitrate lowers the workload of the heart. As a result, the heart muscles do not need much blood and oxygen supply. Isosorbide Mononitrate Injection exporter in India. We are leading Exporter and Manufacturer of Levosimendan Lyophilized Injection. Levosimendan makes the heart pump blood with more strength and force, which increases the blood circulation throughout the body. Levosimendan Lyophilized Injection Lyophilized Injection exporter in India. We are leading exporter and manufacturer of Norepinephrine Injection. Norepinephrine Injection exporter in India. We are leading Exporter and Manufacturer of Furosemide Injection. Furosemide lowers the swelling by removing the levels of excess water and electrolytes in the body. Furosemide Injection exporter in India. We are leading Exporter and Manufacturer of Dopamine Injection. Dopamine 200mg injection makes the heart pump blood with more strength and force, therefore, increasing the blood pressure. Dopamine Injection exporter in India. We are leading Exporter and Manufacturer of Valsartan Tablets. Valsartan Tablets exporter in India. We are leading Exporter and Manufacturer of Dobutamine Lyophilized Injection. Dobutamine 250mg injection makes the heart pump blood with more strength and force, therefore, increasing the blood pressure. Dobutamine Injection exporter in India. We are leading Exporter and Manufacturer of Ketoprofen Injection. Ketoprofen blocks the release of certain chemical messengers that are responsible for inflammation, pain, and fever. Ketoprofen Injection exporter in India. We are leading Exporter and Manufacturer of Levocarnitine Lyophilized Injection. Nausea, Palpitations, Paresthesia (tingling or pricking sensation), Peripheral edema, Gastrointestinal discomfort, Anemia, Muscle pain, Bone pain, Bronchitis, Cough, Diarrhoea, Gastritis, Headache, Increased calcium level in blood, Increased blood pressure, Muscle weakness, Tachycardia, Vertigo, Vomiting. Levocarnitine Injection exporter in India. We are leading Exporter and Manufacturer of Phentolamine Mesylate Lyophilized Injection. Phentolamine Mesylate for Injection, USP, is an antihypertensive, available in vials for intravenous and intramuscular administration. Each vial contains Phentolamine mesylate USP, 5 mg and mannitol USP, 25 mg in sterile, lyophilized form. Phentolamine Mesylate for Injection is indicated for the prevention or control of hypertensive episodes that may occur in a patient with pheochromocytoma as a result of stress or manipulation during preoperative preparation and surgical excision. Phentolamine Mesylate for Injection is indicated for the prevention or treatment of dermal necrosis and sloughing following intravenous administration or extravasation of norepinephrine. Phentolamine Injection exporter in India. We are leading exporter and manufacturer of Amlodipine And Atenolol Tablet. Amlodipine And Atenolol Tablet exporter in India. Treating high blood pressure or chest pain caused by angina. It is also used to decrease death due to problems after a heart attack. It may also be used for other conditions as determined by your doctor. Blurred vision, cold hands or feet ,confusion, difficult or labored breathing, dizziness, faintness, or lightheadedness when getting up from a lying or sitting position suddenly ,shortness of breath, sweating. Inhibiting the influx of calcium ions into vascular smooth muscle and cardiac muscles. Blocking receptors resulting in slowing of heart rate and reducing oxygen demand. We are leading exporter and manufacturer of Esmolol Hydrochloride Injection. Esmolol Hydrochloride Injection is indicated for the treatment of tachycardia and hypertension that occur during induction and tracheal intubation, during surgery, on emergence from anesthesia, and in the postoperative period, when in the physician's judgment such specific intervention is considered indicated. anxiety,drowsiness,nausea,vomiting,headache,nervousness, and redness of the face and neck. Esmolol Hydrochloride Injection exporter in India. We are leading Exporter and Manufacturer of Enalapril Tablet. Enalapril is used in the treatment of increased blood pressure , heart failure, heart attack and diabetic kidney disease. Enalapril relaxes the blood vessels which lowers the blood pressure and also reduces the workload of the heart. As a result, the heart works more efficiently. Enalapril Tablet exporter in India. We are leading exporter and manufacturer of Irbesartan Tablet. Irbesartan is used in the treatment of increased blood pressure , heart failure, heart attack and diabetic kidney disease. Irbesartan relaxes the blood vessels which lowers the blood pressure and also reduces the workload of the heart. As a result, the heart works more efficiently. Fatigue, Orthostatic hypotension (sudden lowering of blood pressure on standing), Weakness, Dizziness, Anemia, Renal impairment, Increased potassium level in blood, Vertigo. Irbesartan Tablet exporter in India. We are leading exporter and manufacturer of Gemfibrozil Tablet. Gemfibrozil is used in the treatment of increased cholesterol levels in blood and increased triglycerides levels in blood. Gemfibrozil stimulates the formation of enzymes for triglyceride metabolism, which in turn lowers the levels of triglyceride and cholesterol in the body. Gemfibrozil Tablet exporter in India. We are leading exporter and manufacturer of Sterile Nitroprusside Sodium Injection. Sodium nitroprusside is intravenously infused in cases of acute hypertensive crises.Its effects are usually seen within a few minutes. Nitric oxide reduces both total peripheral resistance and venous return, thus decreasing both preload and afterload. So, it can be used in severe congestive heart failure where this combination of effects can act to increase cardiac output. In situations where cardiac output is normal, the effect is to reduce blood pressure. Sterile Nitroprusside Sodium Injection exporter in India. We are leading exporter and manufacturer of Nimodipine Injection. Nimodipine is a calcium channel blocker. It blocks the action of calcium on the blood vessel of the brain. This prevents changes in brain function after bleeding around the brain (subarachnoid hemorrhage). Headache, Nausea, Decreased blood pressure, Slow heart rate. Nimodipine Injection exporter in India. We are leading exporter and manufacturer of Isosorbide Mononitrate Tablet. Isosorbide Mononitrate is used in the treatment of angina and heart failure. Isosorbide mononitrate lowers the workload of the heart. As a result, the heart muscles do not need much blood and oxygen supply. Isosorbide Mononitrate Tablet exporter in India. We are leading exporter and manufacturer of Amlodipine And Ramipril Tablet. Treating high blood pressure or decreasing the risk of heart attack, stroke, and death in certain patients. It may be used alone or with other medicines. It is used along with other medicines to manage heart failure and improve survival after a heart attack. It may also be used for other conditions as determined by your doctor. Take ramipril exactly as prescribed by your doctor. Follow all directions on your prescription label. Your doctor may occasionally change your dose. Do not take this medicine in larger or smaller amounts or for longer than recommended. Amlodipine And Ramipril Tablet exporter in India.